30W with 6L6s, 15W with 6V6s. (4) 12AX7s, (2) 6L6s or (2) EL34s or (2) 6V6s and (1) GZ34 (5Y3 with 6V6s). AB push-pull with with cathode bias. Bass, Middle, Treble, presence, and RAW controls plus BRIGHT switch. All-tube driven, 3-spring medium delay Accutronics tank in a padded reverb bag with shielded cables and TONE control. Now featuring an 18-gauge non magnetic stainless-steel chassis with TIG welded corners. Hand-wired point-to-point with tinned solid-core PVC wiring, G-10 glass epoxy circuit board with brass eyelets. Carbon film resistors, Mallory M150 and CDM silver mica tone capacitors, Switchcraft jacks, Carling switches, and high-quality molded type sockets. Cool and quiet running Allen TP40D 180ma power transformer, TO35MT upgrade paper bobbin interleaved winding output transformer, TR reverb transformer and TRCH large choke are all U.S. made. See the TRANSFORMERS page for details. 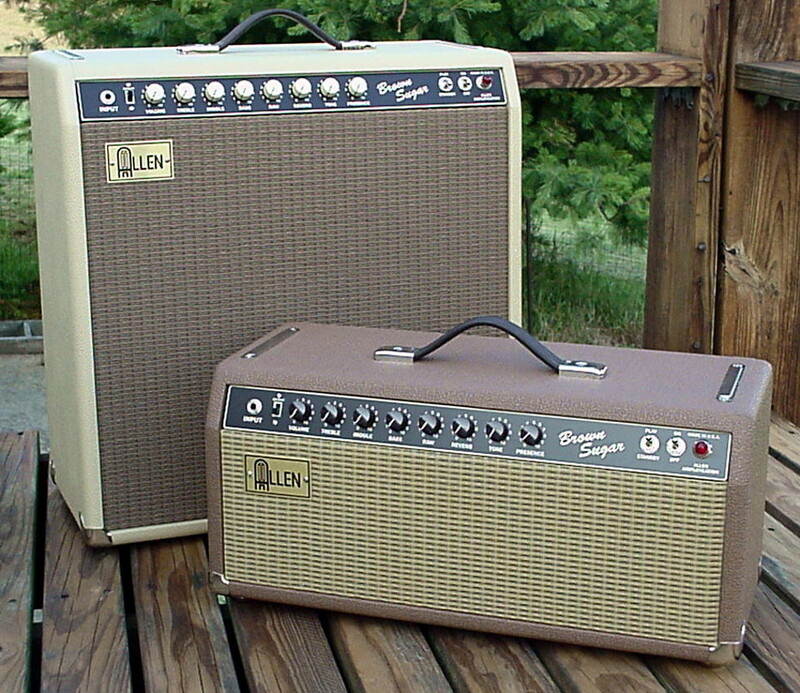 A unique blend of a brown-era preamp (tone controls, phase inverter and presence control) with a tweed-era cathode-biased output section and wonderful blackface-era reverb. 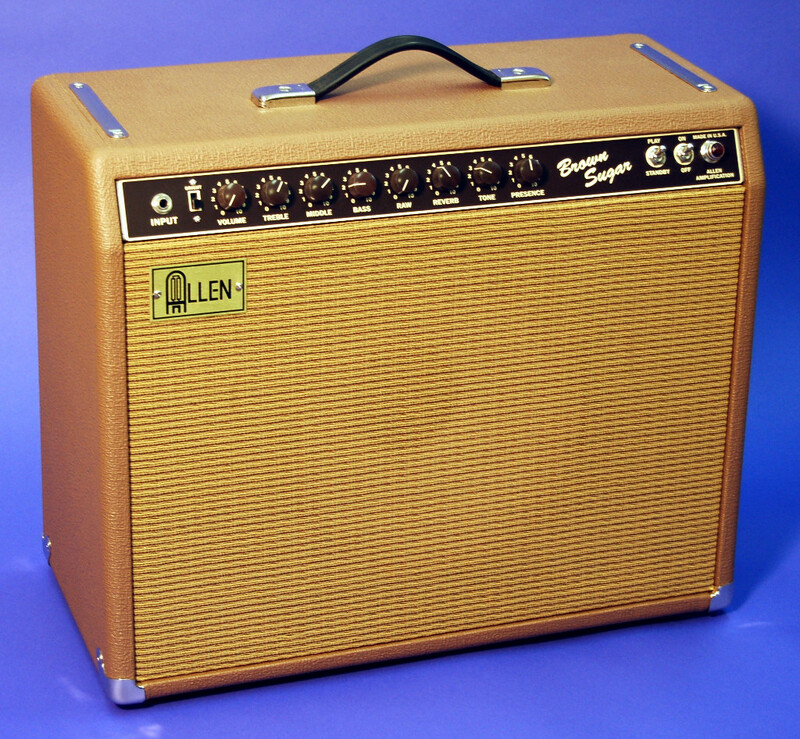 Enhanced with a bright switch, middle and RAW controls, reverb TONE control, impedance switch and the ability to use 6V6, 6L6 or EL34 power tubes for a truly unique and versatile amp with the best qualities of each era in one handsome package. 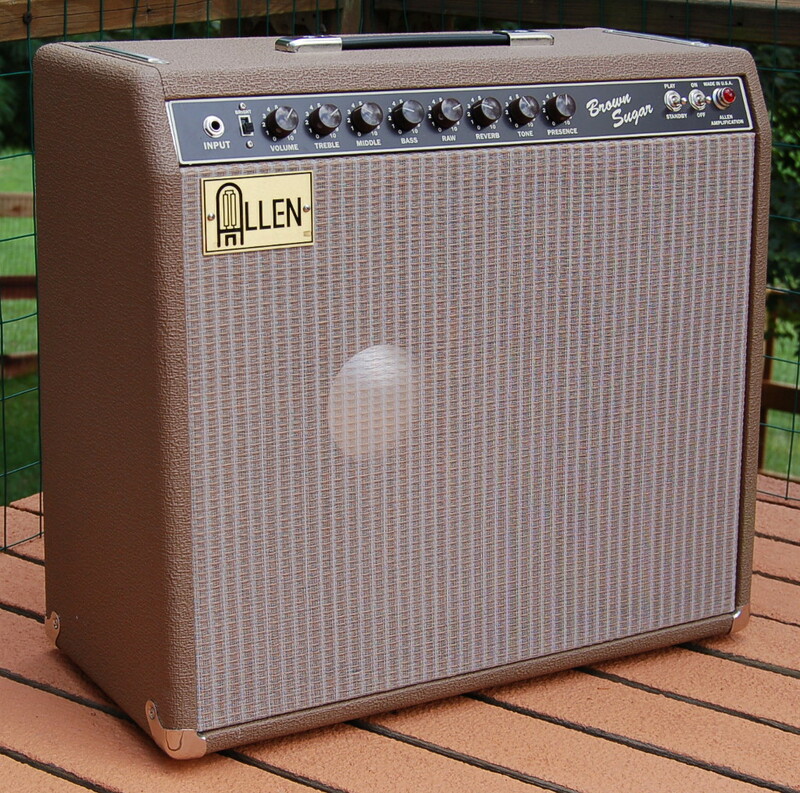 Finger-jointed pine with custom brown Tolex and grill cloths. Brushed brass logo, brown/ivory faceplate and black or cream barrel knobs. Eminence Red, White and Blues 12" speaker, Eminence Legend 151 15", or (2) Eminence Copperheads 10". RAW mid/gain boost control, presence control, impedance switch, extension speaker jack, and TONE control for the reverb. Brown era tone controls and phase inverter with cathode bias. Blackface era reverb. 1x15 Combo - 22"W x 20"H x 10"D, 53 lbs. 1x12 Combo - 22"W x 18"H x 10"D, 51 lbs. 2x10 Combo - 22"W x 20"H x 10"D, 53 lbs. Head - 22"W x 10"H x 10"D, 32 lbs. 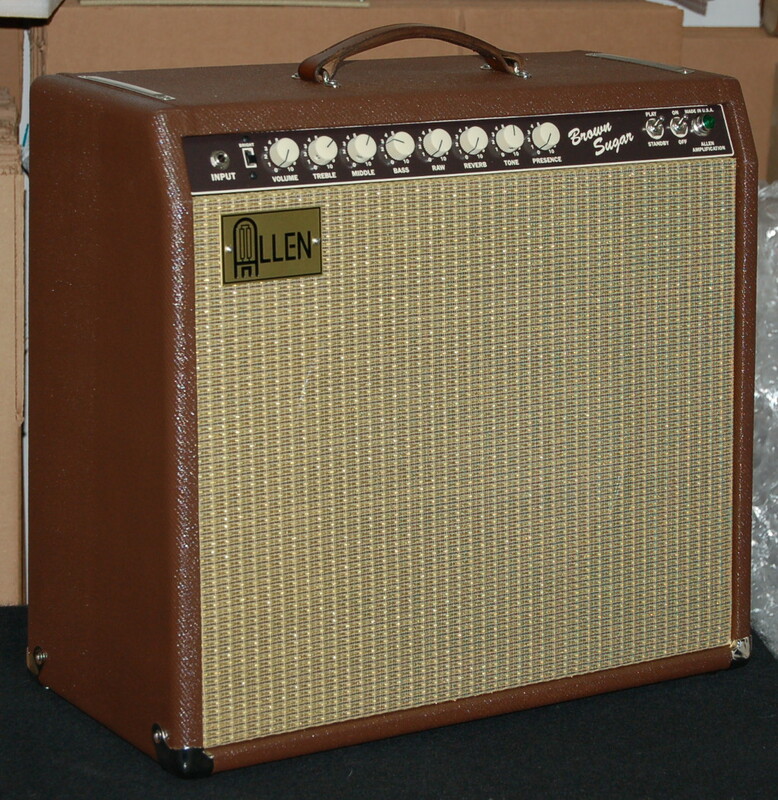 Tony Sims checks out the Allen Brown Sugar amp. 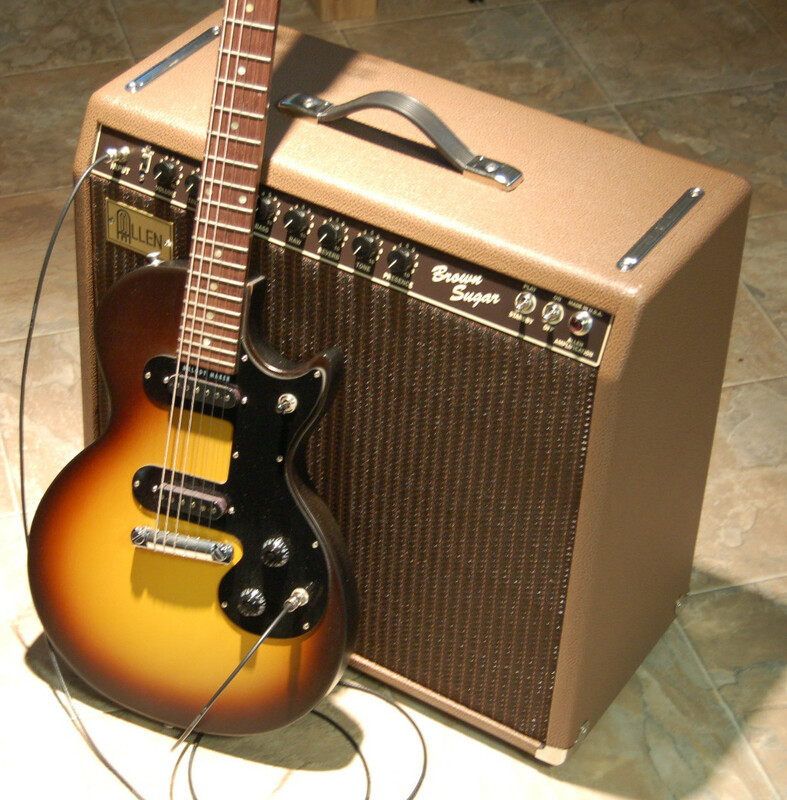 Cross-cut Saw cover by Jammy Smith (playing straight into a Brown Sugar with 6L6s and an Eminence Big Ben 15" speaker, no pedals, and the bridge pickup is a Duncan broadcaster). Jimmy Smith - Blues Demo, playing a 1969 Gibson Les Paul Deluxe with P90s into a Brown Sugar.